Kate Spade Sunglasses, Highest quality prescription Rx - Eyeglasses.com since 1999. Kate Spade Sunglasses. There is something irrepressible about the dynamism Kate Spade brings to her sunglasses. She is not the first artist to bring a European sensibility to the American scene, furthering the sporty, the colorful and the endearing enthusiasm of the midwest. 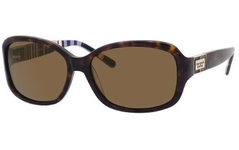 Kate Spade sunglasses show the energy, flair and casual vigor of the Kate Spade brand. The best of both influences are combined to form the inimitable. Kate Spade sunglasses are sure to appeal to the diverse life styles of many. While growing up in Kansas City, Missouri, Katherine Noel Brosnahan, now Kate Spade, was both the epitome and antithesis of the all-american girl. There was always something charmingly familiar yet wonderfully original about Kate. Her fresh sense of style and singular personality reflect a keen sense of wit, propriety, and a no-nonsense approach to life. Kate has spent most of her professional career in the accessories business, bringing recently Kate Spade sunglasses to the fashion world. Follow this link to see the official website of Kate Spade.